A Night of Shakespeare with NEMPAC’s Doug Bowen-Flynn! Do you like Shakespeare, but sometimes wish you had a viewing guide? Want to understand the play better as you watch it, and to join fellow adults for a fun evening of Shakespearean insight? Join NEMPAC Board Member Doug Bowen-Flynn on Thursday, May 11th for a night of Shakespeare, comedy, and tasty food! Guests will enjoy catered appetizers and camaraderie with fellow theatre goers while Doug provides insights about A Midsummer Night’s Dream, soon to be performed in Boston by Actors’ Shakespeare Project, Boston’s professional Shakespearean theatre company, from May 10 – June 4. 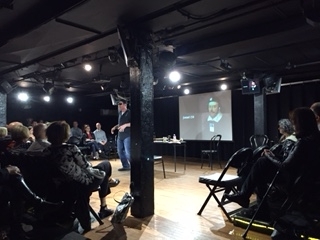 NEMPAC’s Shakespeare Workshops with Doug have engaged audiences in a variety of events, such as the “50 Shades of Shakespeare” event at the Improv Asylum in 2015, and the “Richard II” Workshop at Cafe Paradiso in March, 2016. A local Shakespeare expert and actor, Doug takes attendees on a hilarious journey through Shakespeare’s life as it relates to the play at hand, providing interesting details and tidbits about the historical context and the plot itself. Food for the evening will be catered by Manda & Me. TICKETS available here: Shakespeare Workshop. Thursday, May 11th, 2017 | 6:00 p.m. – 7:30 p.m.